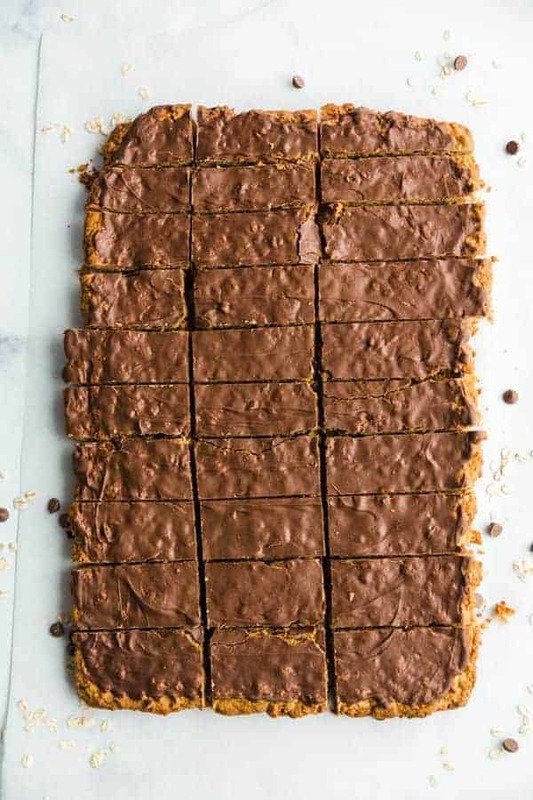 Sheet pan Chocolate Peanut Butter Oatmeal Cookie Bars are rich and soft cookie bars that are prefect for feeding a crowd or enjoying with friends. I love this recipe! 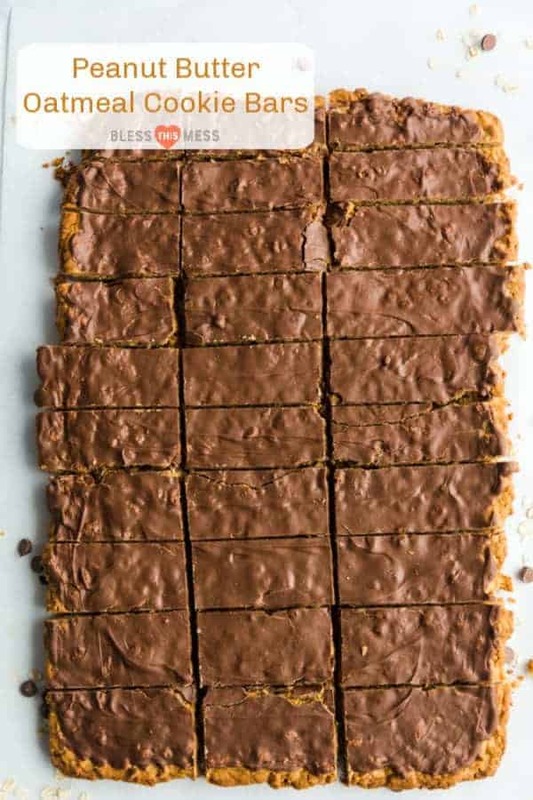 This is one of those easy recipes that just turns out well every time, everyone loves it, and it makes a whole sheet pan. These are great when you need to take a dessert to a gathering. I also like to make a large pan for the kids and their friends on Friday afternoons when everyone meets at our house to play. This is also a great recipe to make if you are taking dinner to friends. Half the batch can stay at your house and half the batch can go with dinner. 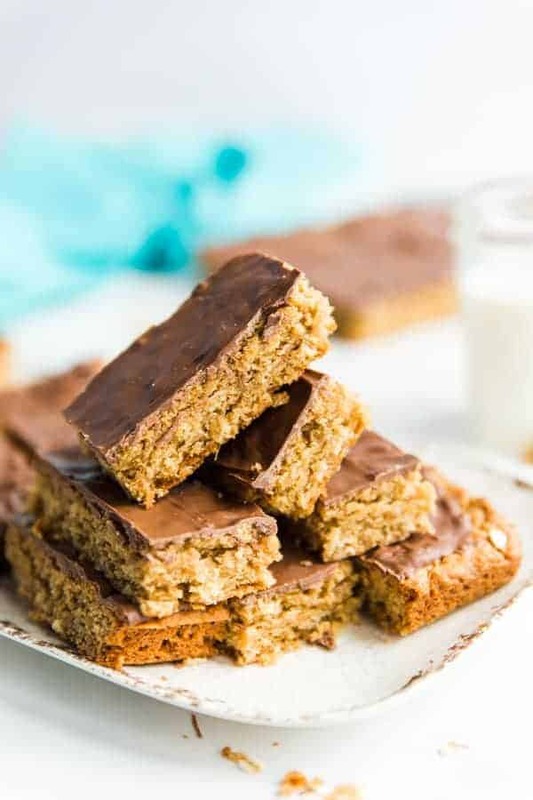 This recipe is awesome because it has chocolate, oatmeal, and peanut butter in it which are three of my favorite things. I know your family will like these as much as we have and that you will like just how easy they are to make. Long live the bar cookie! Love dark chocolate? Feel free to use semi-sweet chocolate chips. 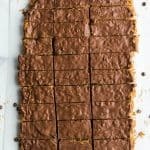 Really, you can use any chocolate chips you like or have on hand (peanut butter is also awesome!). This recipe works best with traditional creamy peanut butter. When I tried it with natural peanut butter, it was a bit dry. You can use quick oats in this recipe; it’ll work just great. The texture will be slightly less chewy than when you use old-fashioned oats. In oatmeal cookies, old-fashioned oats will give you a chewier texture, and quick oats will be slightly less chewy, but the flavor is the same. It’s really personal preference which one you like better for baking. For this recipe, I like the chewier old-fashioned oats, but both kinds work great. Can you freeze oatmeal cookie bars? Yes! Once the cookie bars are baked, cut, and cooled, they freeze great. Just store them in a single layer (or with parchment or waxed paper between layers) in an air-tight container up to 2 months. In a small bowl, stir together oats and milk. Set aside so that oats can start to soften. In a medium mixing bowl, cream together the sugars and the butter until fluffy. Add peanut butter and incorporate. Stir in flour and soda. Stir in oat and milk mixture. Batter will be sticky. Spread batter into a large rimmed greased cookie sheet or jelly roll pan. Bake for 20-25 minutes. The cookies should be lightly golden but not too dark. When the bars come out of the oven, sprinkle the chocolate chips evenly over the top and let sit for 3-5 minutes until the chips start to look shiny and melt. 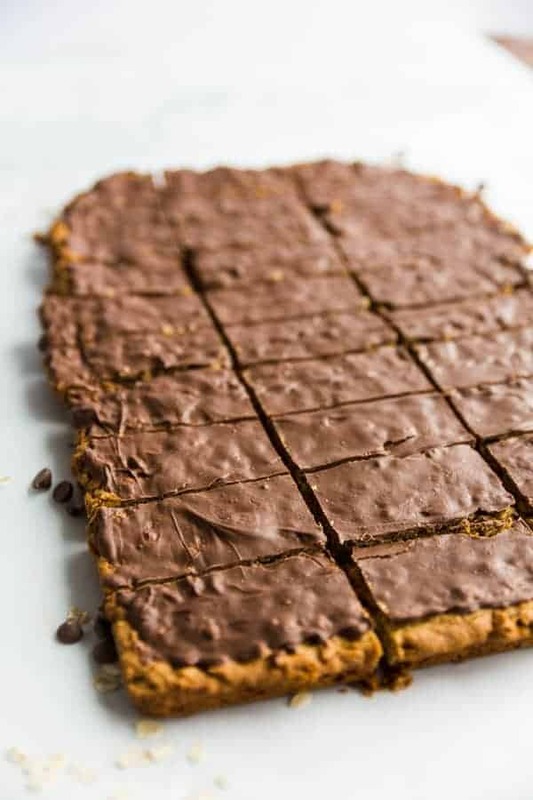 Spread the chocolate chips all over the top with a spatula. Let cool before cutting into squares. You can use quick oats in this recipe; it’ll work just great. The texture will be slightly less chewy than when you use old fashioned oats. There’s one easy recipe for you, updated from the 2010 archives. Enjoy from my kitchen to yours. When you say cookie sheet or jelly roll pan, what size do you mean? The pin seemed to imply it was a sheet pan recipe, so now I’m confused. My sheet pans are jelly roll pans! I think as long as it has an edge on it, it’ll work. If you are using a pan slightly smaller than jelly roll you might want to add a few minutes to the cooking time to account for the thicker cookie.